If you’re having troubles with the code from pastebin, head over to Martin Kool’s tumblr for another way to capture the bookmarklet. For screen real estate purposes, Firebug will look best on the iPad, but it works on the iPhone and iPod touch with Safari too. You probably won’t be getting tons of serious web development done with this, but it’s a great trick and definitely usable enough to make minor changes and quick adjustments to web elements while using iOS. Doesn’t seem to be working on iPad 1, 3G, 32 GB, iOS 5.0.1; is there some other pre-requesite? Koder app has a built in firebug lite support. Thanks so much for sharing this tip. I’ve been using Koder to edit remote theme files for a while (and loving it) but had never noticed the firebug functionality as I hadn’t touched the preview tools… This is awesome! Thank you, it just works perfectly! 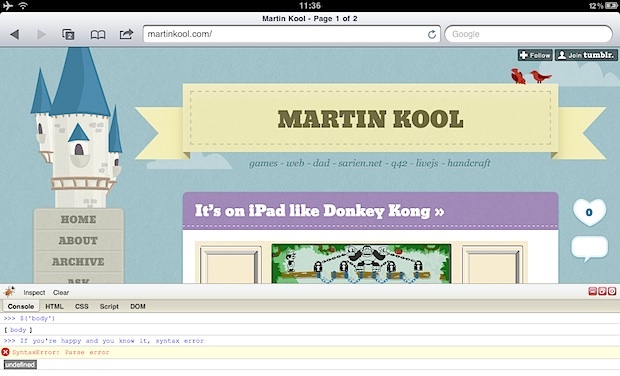 It opens the firebug in ipad or iphone, but able to inspect the each elements properly.